In Operate, you have the ability to bundle items together so that one inclusive price appears on the client's invoice, but you are actually charging for two items. Bundling is available within three key areas of Operate: Invoices, Credit Notes and Licences. In this article we will first look at how this works, what you need to do to enable the system to bundle items, and how to do this within each of the modules. The product(s) you want to include within a bundle. The main bundle product, which will include all of the other products (#1). This will be the product to select in Operate, whenever you want to create a bundle. The Office Space configured as an Office product type. The internet service, configured as a Service product type. The telephone service, configured as a Service product type. The Membership Plan itself, configured as a Service product type. If you require a separate fee for this plan, it will need to be set as its price. If you do not require a fee, the membership plan is still needed, but you can leave the price as "£0". This is the main product you will use for the entire bundle, the one you would need to select in Operate under the 'Bundle With' fields, as explained below. When you create a bundle, Operate will invoice all of the included products together. All of the products will be listed on your invoices, but their price will be "£0". The prices of all your products will be summed up and billed under the main product you have bundled everything with (e.g. the Membership Plan in the example above). This main product will bill its own price (if any) plus the sum of all products bundled with it. 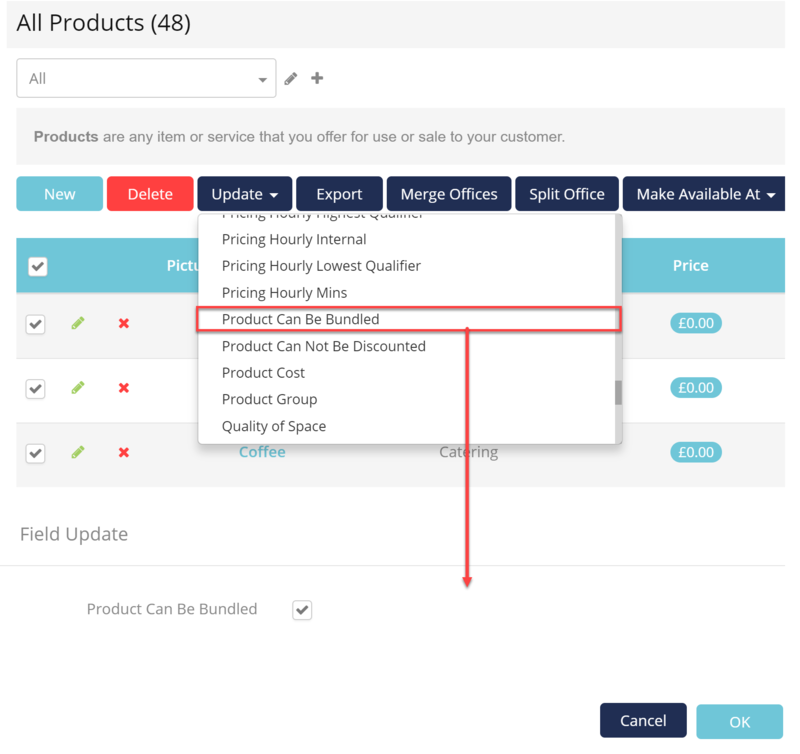 Please note that if you have discounts configured on products you use within bundles, we recommend that you do not include a Discount field on your invoices as it will show a value (a % of the product's actual price), while bundling it will determine your invoice to show its price as "£0". In a nutshell, it will not make much sense to have "£0" as a unit price and total and a currency value as a discount. This is due to the fact that at the moment, bundling does not affect discount related fields. Go to the Operate Settings > General > System > Operate Settings > General Settings. Here is where you need to make sure that the 'Enable items to be bundled' checkbox is checked. Go to Space > Products, then use the list view to select the items that you would like to enable bundling for. Click Update at the top of the list, click Product can be Bundled then check the box and click OK in the window that comes up. If you do not have a product that will represent your main bundle, please create one by going to Space > Products and setting it up as a Service product type. This ensures that your main product will be displayed within all Operate sections where bundling is available: Licencing, Invoices and Credit Notes. Please make sure that you also allow this product to be bundled, by checking the corresponding box. To bundle products when creating an invoice, please start by creating your draft invoice first. When adding products to the invoice, you can select your main product (which should have been previously created as shown above), under the Bundle column. Select the main product for all of the items you want to include, then add an invoice line with the main product which you will not bundle. This is so that Operate can list this as the overall bundle and so that the entire amount can be summed up under it. Bundling Credit Note items is similar to bundling within the invoicing module. The difference here is that the purpose is to credit the value of a bundle, while making sure the Accounts are balanced. You will need to include the same items you have included on the invoice in order to zero out the products in your accounts. The process is the same: Create your draft credit note, then add the same lines you have invoiced, making sure to select the main bundle item under the Bundle column and also add it as a separate line without bundling it. To bundle Licence Items, first, set up your licence as usual and add your items. When setting up your licence item, you will simply select what to bundle it with, from under the Bundle With field. When you are ready adding all of your needed products to the bundle, please also add the main product as well. Simply select it under the Contract Services section of your Licence and do not bundle it with anything. This will allow Operate to invoice the sum price of all of your products under this main one.